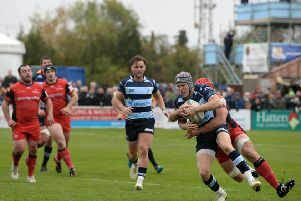 Ampthill RFC director of rugby Mark Lavery has labelled his side’s trip to ex-Championship side Moseley this afternoon as the ‘game of the day’ in National One. The A’s head to Birmingham for a third versus fourth clash, with the visitors one point ahead of their hosts as Lavery said: “It’s game of the day in National One. “Who’d have thought, five years ago, a league game like this would be on for us, let alone us one point ahead of them. That said, Ampthill won 26-8 when the sides met at Dillingham Park at the beginning of October, and Lavery is happy with his team’s form going into Saturday’s game. Ampthill’s openside flanker Joe Bercis makes a return to the club that he played for last season, having been signed from the A’s in 2015 – Lavery resigned the wing forward 12 months later and he’s been a constant in the Ampthill starting XV ever since. Ampthill start with Brett Sturgess, Aleki Lutui and Matt Collins in the front row, Paino Hehea replaces Ben Gulliver in the second row and plays alongside Josh Walker; Matt Burke starts on the opposite flank to Bercis and Maama Molitika continues at number eight. Gav Williams rotates in at scrum half, partnered by Joe Tarrant (fly half) making his 100th first team appearance; Will Goodge (inside) and Sam Hanks (outside) start at centre with wingers Jonny Morgan (right) and Sam Baker (left) in front of Stef Jones.